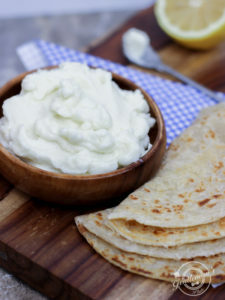 Lebanese Garlic Sauce (also known as Toum or Toom) is a traditional Lebanese condiment perfect for sandwiches and wraps, or even served with a side of pita chips or veggies as a dip! It’s no secret that I love garlic; on bread, with veggies, or even when I sneak a bite from my jar of DIY Minced Garlic #sorry #notsorry. And that’s exactly why I am obsessed with this easy 4 ingredient Lebanese Garlic Sauce! 4 every day ingredients, including garlic, lemon juice, oil, and salt. Also known as Toum or Toom (which happens to be the Lebanese word for garlic), this sauce traditionally accompanies sandwiches (like Shawarmas). Personally, I love getting a heaping bowl full and eating it with pita, crackers, or even veggies like a dip. Best part of all this recipe only requires four every day ingredients, a food processor, and patience! Plus it’s vegan, gluten free, paleo and keto friendly. A food processor works best for making this sauce. 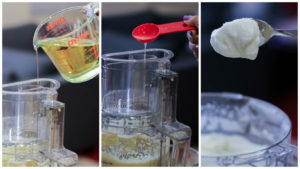 The sauce gets its fluffiness from employing ‘the mayonnaise method.’ Essentially the lemon juice molecules will be trapped by the oil (giving it body), while the garlic will act as the emulsifier (like egg yolks would in mayonnaise). It’s science! I also prefer a food processor for this recipe. The wide bowl allows the emulsion to occur evenly, but also allows enough air to incorporate into the sauce making it light, airy, and fluffy. Slowly pour in your liquid ingredients in a thin stream, alternating between oil and lemon juice; don’t stop until you’ve finished all of your ingredients and the sauce can stay on the spoon as shown. And the final piece is patience. 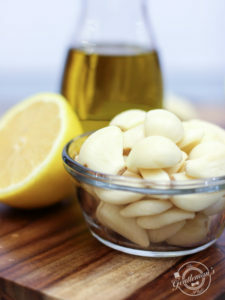 We are creating an emulsion by suspending the water from the garlic and lemon juice in the oil – which means we have to take it slow and drizzle in our liquid ingredients, alternating 4 tablespoons of oil and 1 tablespoon of lemon juice repeatedly until all ingredients are finished. You also want to stop to take frequent breaks. 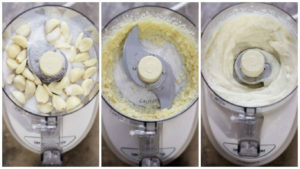 I own a top-of the line Cuisinart food processor, and even with a new machine the motor heats the sauce and creates condensation inside the bowl. As soon as you see water droplets collecting at the top, you should stop and remove the cover and let the motor cool for a few minutes before going back in – we don’t want to break the emulsion with pools of rogue water droplets. Control your garlic sauce – don’t let it control you. I love using this sauce as a dip! Here I am using some Indian flat bread with the freshly made garlic sauce. But that patience does pay off! In the end you are rewarded with the a rich yet delicate sauce that you will want to eat on everything – seriously EVERYTHING. This Lebanese Garlic Sauce is a hit everywhere I take it, and anyone who tries it is simply amazed that it’s only 4 ingredients and vegan. Give it a try for your next potluck, party, or night in, and let me know how it goes in the comments below! This super easy 4 ingredient Lebanese Garlic Sauce goes great on sandwiches, wraps, burgers, or even as a dip. Best of all, it's vegan, gluten free, paleo, and keto friendly! **When using garlic, use freshly peeled or fresh packaged pre-peeled garlic only (not frozen or pre-minced garlic). 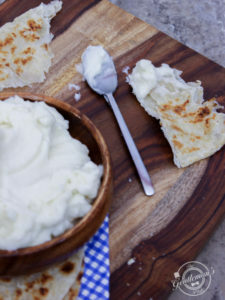 Depending on your garlic, this dip can have a kick to it - I've noticed that the older the garlic is, the milder it gets. Taste your garlic and adjust accordingly. This is my go-to dip for any potluck! I hope you like it as much as I do! This is really good! I’ve been wondering for quite a while how the garlic sauce I get at different Middle Eastern restaraunts I frequent is made, never realized it was this simple! So far I’ve eaten it on carrots, broccoli, crostinis and even a slice of pizza. It’s all delicious!